The universe that we live in has only 3 spatial dimensions. We are limited to length, width, and height, and we can only travel along three perpendicular paths. What would be the properties of a hypothetical universe with a spatial fourth dimension? People generally call time the 4th dimension in the universe we live in. Can you visualize the way dimensions increase when considering the fourth dimension? We can. We call it 4th Dimension Enterprises, Inc.
Claude Bragdon, an American architect, writer, and stage designer, said, "To live intuitively is to live fourth dimensionally." The teachings of Florence Scovel Shinn state that "intuition is a Spiritual faculty above the intellect. It is the 'still small voice' commonly called a hunch." 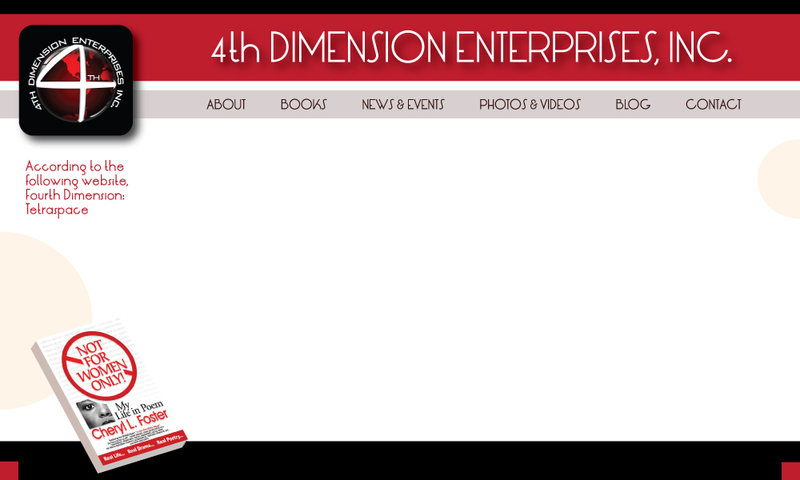 Our goal at 4th Dimension Enterprises, Inc. is to create things that will assist you to live intuitively--that is, in the 4th dimension. What happens when you live intuitively, in the 4th dimension, and why would you want to live intuitively? Our book, 'Not for Women Only! -- My Life in Poem,' is proof of what can happen when one follows that 'still small voice'.